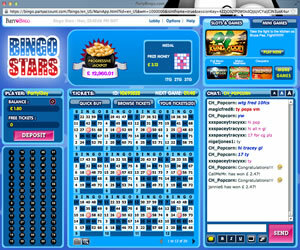 Party Bingo is owned by Bwin Party Digital Entertainment plc, which became the worlds largest online gaming business after merging with PartyGaming in 2011. The company is now the market leader in online bingo with such names as Cheeky Bingo and Foxy Bingo sitting alongside Party Bingo under the company umbrella. All of this experience can clearly be seen in the design of Party Bingo. The home page is well laid out with an attractive blue and pink colour scheme that will appeal to both male and female players alike. All of the important information you need is prominently displayed, but with good banner use they have made sure it does not look too cluttered. 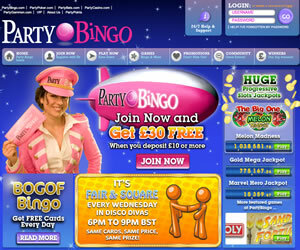 Registering at Party Bingo is a simple procedure and because they are a standalone site you won't have any of those annoying messages telling you that you need to choose a new username or email address; a common problem on many of the networked bingo sites. As a new player you will be welcomed with a 300% first deposit cash match bonus up to a maximum of £150, and they offer a variety of different ways to credit your account including Visa and Debit cards and the majority of secure online systems such as PayPal and Ukash. The Party Bingo lobby is one area that is definitely letting down the online bingo site as sadly there are only three 90 ball bingo rooms and two 75 ball bingo rooms. This would normally not be a big deal, but when they are only open at set times of the day you are sometimes left with no choice e.g. at the time of writing this review at 1pm on a Saturday afternoon we can only play 90 ball bingo as the 75 ball bingo rooms do not open until 3pm and 7pm. The bingo rooms are however warm and welcoming and you are sure to make some new bingo buddies. The rooms are nicely designed with a large area dedicated to displaying to your cards with the jackpots you are playing for clearly shown at the top of the page. The PartyGaming sofware has minimal options built in but you can change your dauber colour and there is a selection of emoticons that can be used in the chat room. Tickets in the bingo rooms start at 5p each but if you are playing on a tight budget make sure you take advantage of the free bingo room and the bargain bingo room both of which are open from 6pm in the evening. To help your money stretch even further, Party Bingo offers BOGOF Bingo in their Lilac Lounge between 7am and 8am, 1pm and 2pm and 10pm and 11pm, and in the Bingo Fiesta room between 11am and 12pm and 4pm and 5pm. Party Bingo really is a bit of a mixed bag sadly and seems to be more style over substance. Don't get us wrong, they are not necessarily doing anything badly and you are sure to have a good time if you play there but we can't help but feel they could be doing a lot more. If you look at the games, the offers and the promotions offered by the competition, they are definitely trailing a long way behind. 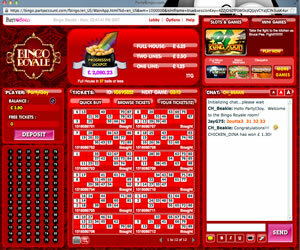 Party Bingo currently offers 75 and 90 ball bingo games alongside a selection of slots and casino games. The wagering requirement for the 300% welcome offer is 3 x the amount of the deposit plus the bonus on bingo cards, or 25 x the amount of the deposit plus the bonus on slots or jackpot slots.